Good morning! Today I have the last of my OPI The Amazing Spider-man looks. 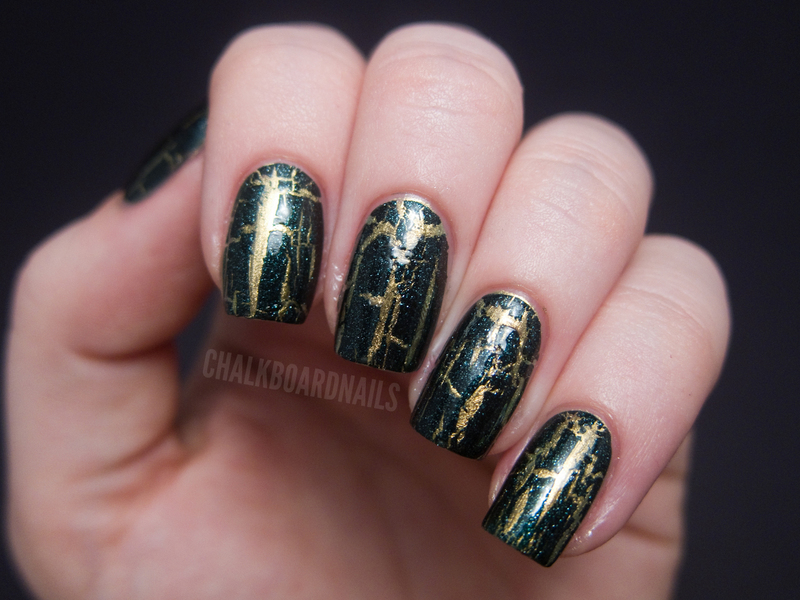 I originally wanted to try a tape mani using this shatter, but, interestingly enough, the shatter polish totally wrecks the tape. It makes it deteriorate so that when you try to pull the tape off, the tape rips and bits stay stuck to the nail. Cool bit of science going on there, I'm sure, but it's a no go for tape manicures! 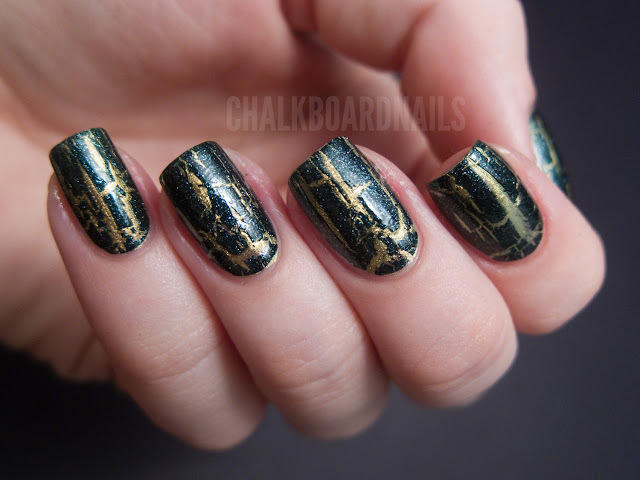 OPI Shatter the Scales is the shatter polish that accompanies the Spider-man collection. The color is really lovely, a pretty glittery forest green. It has a lot of depth, especially after it is topcoated. I have it here layered over OPI Just Spotted the Lizard. I chose that color as a base because I thought it looked the coolest. Something about the duochrome/glitter shatter combo is appealing to me. Many of you know the deal with shatter polish by now, but let's review! It will only work properly on top of a DRY manicure. I sped up the process by applying a fast dry topcoat on top of Just Spotted the Lizard and letting that dry. Then, quickly and deftly apply a coat of the shatter. Give it a few moments and your shatter effect will appear! The OPI Amazing Spider-man collection is available now at Professional Salons, including Beauty Brands, Beauty First, Chatters, Dillard’s, JCPenney, Pure Beauty, Regis, Trade Secret, and ULTA. The polishes retail for $8.50 per bottle. Product samples provided to me by the manufacturer or their PR. Very cool. How strange that the tape deteriorated after having shatter polish on it, I wonder what that's all about! Love this!!! I was worried about my Just Spotted the Lizard looking too icky on me, but I will FOR SURE try it with shatter to dull down the green a bit, so my olive skin doesn't look too..well, olive. Lol. Thank you for sharing! Very awesome. Interesting about the tape, too. Guess you never know until you try, huh? Very pretty! That is soo weird about the tape! I wonder if it's just an OPI shatter problem? I did a scotch tape mani with a China Glaze crackle and didn't have any strange reactions. Weird. 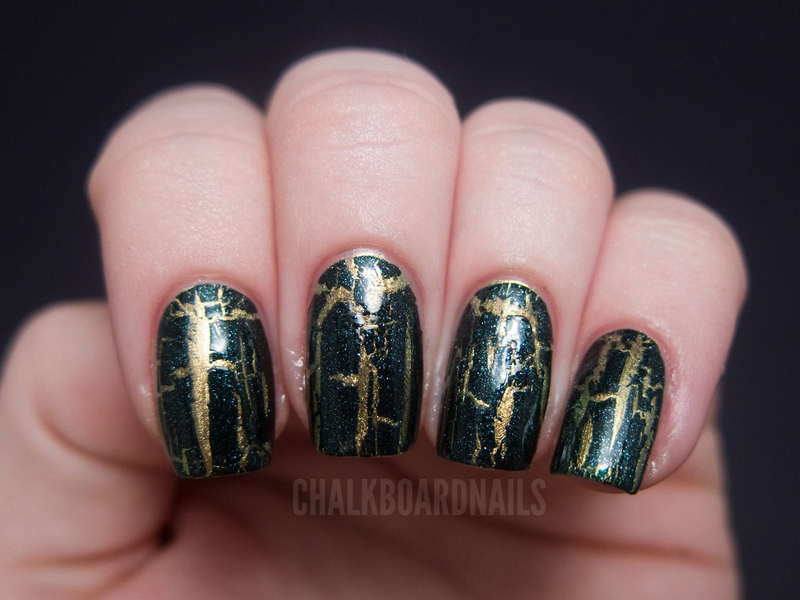 I am not a huge fan of crackle polish, but this looks amazing! Nice contrast between the 2 greens. I think your problem with the tape is either specific to this color or to a bad batch. I remember trying 3 OPI shatters (black,silver and turquoise) over a neon orange a while back, and none of them had the issue you mention with the tape.